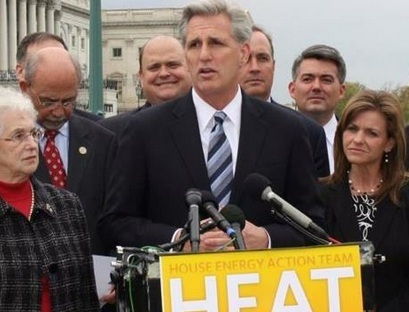 Earlier this month, Rep. Kevin McCarthy (R-CA) founded the House Energy Action Team (HEAT), a "committed group of House members" dedicated to "promot[ing] Republican energy policies." Thirty-four members of Congress were recruited to the cause, dedicating their district work period to "promoting energy independence for America." As McCarthy's press office put it, the dedicated members of the HEAT squad would "clearly demonstrate that House Republicans are on the side of the small businesses and families." Judging from their campaign coffers, however, reasonable citizens might question who these members are really fighting for. Members of HEAT have already received nearly $1.3 million in campaign contributions from the oil and gas industry in the 2012 election cycle alone (according to a Political Correction records search on OpenSecrets.org of each individual HEAT member, excluding contributions from individuals). The average amount received per member comes in at about $38,232; HEAT leader Rep. McCarthy alone has received over $114,000. Flores toured the Enervest site as a part of the nationwide House Energy Action Team 2012 American Energy and Jobs Tour. The point of the tours is to "highlight America's domestic energy resources and the need to increase domestic production." "The oil and gas industry is vital to our economy and hydraulic fracturing is an integral tool to increase domestic energy production," Flores said. "I am working with my colleagues in Congress to ensure that Americans are able to take advantage of one of our great natural resources we have in Texas that provides well-paying jobs, improved tax bases for Texas school districts, and lower energy prices. In [a] nutshell, if we want to have American energy security, we need to develop a smart, stable and transparent regulatory scheme for hydraulic fracturing." According to OpenSecrets.org, the "oil and gas industry" is the number one donor to Flores's 2012 campaign. In addition to money from energy industry PACs, he's received thousands of dollars this election cycle from James C. Flores, an executive at Plains Exploration and Production (PXP). PXP was in the news in recent weeks after it began fracking in southern California's Baldwin Hills Oil Field, a move that allegedly broke promises to nearby communities concerned about the safety of the process. HEAT members are currently touring the nation's oil fields and energy companies. They're tweeting up a storm about the need for an "all-of-the-above energy solution," but they ignore green energy, the public health risks of drilling practices like fracking, and the economic realities of expanded domestic drilling (hint: it won't drive down gas prices). And none of them disclose the tens of thousands of dollars they're receiving from oil and gas companies. In other words, it's just a lot of hot air.